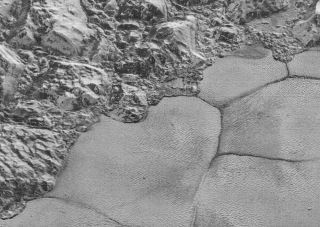 Small section of a close-up view of Pluto showing some of the dwarf planet's mountains and nitrogen-ice plains, as seen by NASA's New Horizons spacecraft. Image released on May 27, 2016. Pluto's exotic and incredibly varied landscapes dazzle in the sharpest views of the dwarf planet released to date. The images, which feature a resolution of about 260 feet (80 meters) per pixel, were captured by NASA's New Horizons spacecraft during its epic flyby of Pluto on July 14, 2015. Mission team members have stitched the photos into a high-resolution mosaic and used them to create a stunning new video of Pluto that highlights the dwarf planet's towering water-ice mountains and nitrogen glaciers, among other exotic features. "This new image product is just magnetic," Alan Stern, New Horizons principal investigator from the Southwest Research Institute in Boulder, Colorado, said in a statement Friday (May 27). "It makes me want to go back on another mission to Pluto and get high-resolution images like these across the entire surface." The mosaic covers a long, roughly 50-mile-wide (80 kilometers) strip of the "encounter hemisphere" — the face of the dwarf planet that New Horizons saw during its historic flyby. "Starting with hummocky, cratered uplands at top, the view crosses over parallel ridges of 'washboard' terrain, chaotic and angular mountain ranges, cellular plains, coarsely 'pitted' areas of sublimating nitrogen ice, zones of thin nitrogen ice draped over the topography below and dark mountainous highlands scarred by deep pits," NASA officials wrote in the same statement. New Horizons captured the images from a distance of about 9,850 miles (15,850 kilometers) on July 14, 23 minutes before the probe's closest approach to Pluto (which brought it to within 7,800 miles, or 12,550 km, of the dwarf planet's surface). Though the encounter took place more than 10 months ago, New Horizons is still beaming flyby data home, and likely won't be done doing so until this coming fall, mission team members have said. New Horizons may have another flyby in its future. Stern and his colleagues have submitted a proposal to send the spacecraft — which launched in January 2006 — zooming past a small object about 1 billion miles (1.6 billion km) beyond Pluto, called 2014 MU69. If NASA approves and funds this mission extension, the encounter with 2014 MU69 would take place Jan. 1, 2019.